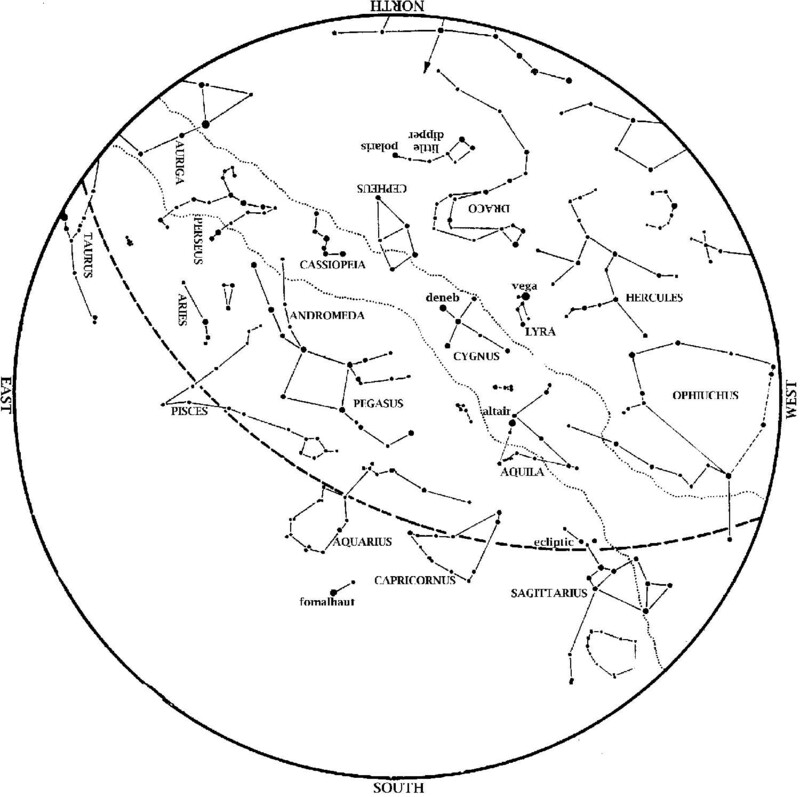 This star map shows the Houston sky at 10 pm CDT on October 1, 9 pm CDT on October 15, and 8 pm CDT on October 31. To use the map, put the direction you are facing at the bottom. Autumn represents sort of an ‘intermission’ in the sky, with bright summer stars setting at dusk, while bright winter patterns such as Orion have not yet risen. The ‘teapot’ of Sagittarius sets in the southwest early in the evening. The Summer Triangle is high in the west. Meanwhile, the Great Square of Pegasus is in the east, indicating that autumn has begun. The stars rising in the east are much dimmer than those overhead and in the southwest because when we face east at dusk in October, we face out of the Milky Way plane. The center of our Galaxy lies between Scorpius and Sagittarius, while the Summer Triangle is also in the galactic plane. Pegasus, on the other hand, is outside the plane of our galaxy and is a good place to look for other galaxies. Nearby constellations Andromeda and Triangulum (a small triangle) contain the spiral galaxies nearest to our own. 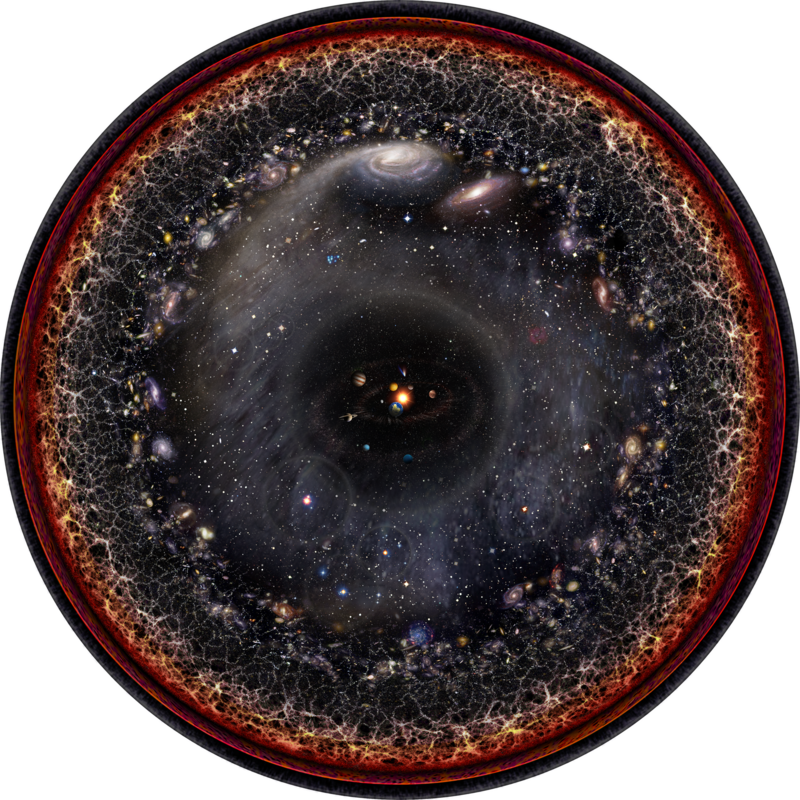 Artist’s logarithmic scale conception of the local region of the universe with the Solar System at the center, inner and outer planets, Kuiper belt, Oort cloud, Alpha Centauri, Perseus Arm, Milky Way galaxy, Andromeda galaxy, nearby galaxies. Author:Pablo Carlos Budassi. Source: Wikimedia Commons. Venus drops out of the evening sky and into the Sun’s glare this month. Inferior conjunction (Venus aligned between Earth and Sun) is October 26. Jupiter is still low in the southwest at dusk. It appears lower to the horizon each evening at dusk, until by Halloween night it sets in twilight. Saturn remains well placed for evening viewing, in the southwest at dusk, all month. Although significantly dimmer than Mars or Jupiter, Saturn outshines the stars near it, and is therefore just as easy to see. Mars remains brilliant in the south at dusk. Although now considerably dimmer than in July (and gradually fading), Mars still outshines all stars in the October evening sky. 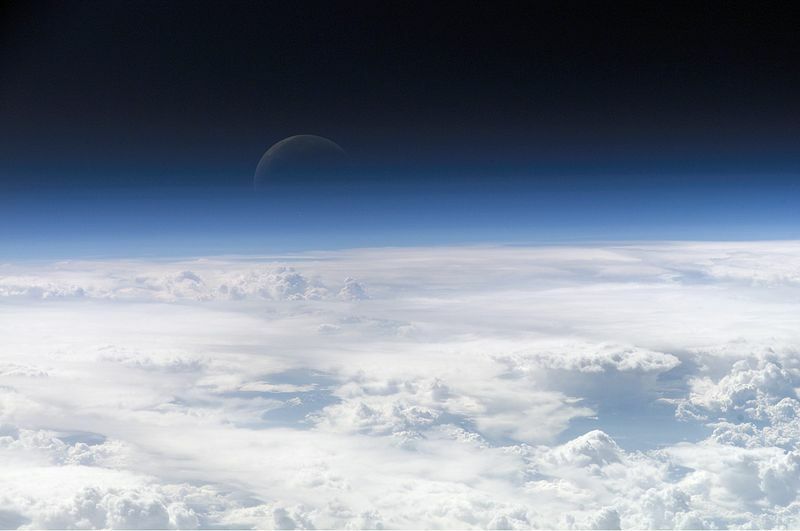 View of the crescent moon through the top of the earth’s atmosphere. Photographed above 21.5°N, 113.3°E by International Space Station crew Expedition 13 over the South China Sea, just south of Macau. Source: Wikimedia Commons. Last Quarter: Oct. 2, 4:45 a.m.; Oct. 31, 11:40 am New: Oct. 8, 10:47 p.m.
1st Quarter: Oct. 16, 1:02 p.m. Full: Oct. 24, 11:45 a.m.
Next Post Are Bananas Really Cursed?